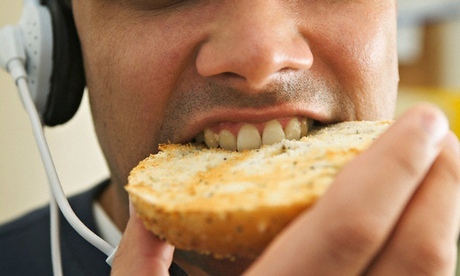 Confirming the hunches of so many ravenous aeroplane passengers, a study published in 2011 found that loud background noise suppresses saltiness, sweetness and overall enjoyment of food. (For flyers, this is compounded by the high altitude blocking nasal passages, and therefore access to aromas.) Incidentally, for those among you who curse that you can’t hear yourself think, or indeed taste, in some restaurants, it isn’t unheard of for the background din to register 90db, which is a tad louder than commercial flights. 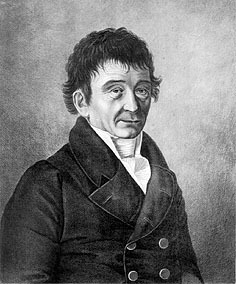 As we slip on our headphones, we might spare a thought for Ernst Florens Friedrich Chladni; he died on this date in 1827. 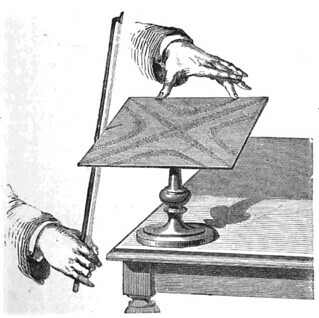 Widely regarded as “the father of acoustics,” he built on the work of Robert Hooke to create “Chladni figures,” demonstrations of complex patterns of vibration; variations of this technique are still commonly used in the design and construction of acoustic instruments like violins, guitars, and cellos. Chladni measured the speed of sound in various gases by determining the pitch of the note of an organ pipe filled with each gas, and determined the speed of sound in solids using analysis of the nodal pattern in standing-wave vibrations in long rods. Chladni was an accomplished musician (and inventor of he musical instrument called “Euphon“), and fathered another science– meteoritics— when, in 1794, he published Über den Ursprung der von Pallas gefundenen und anderer ihr ähnlicher Eisenmassen und über einige damit in Verbindung stehende Naturerscheinungen (“On the Origin of the Pallas Iron and Others Similar to it, and on Some Associated Natural Phenomena”) in which he proposed that meteorites have an extraterrestrial origin.